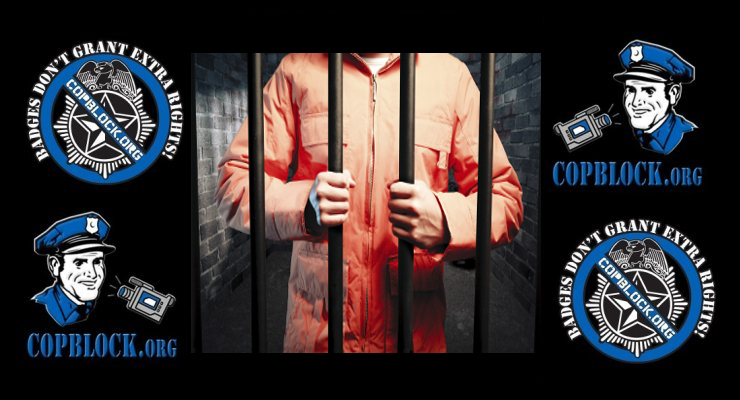 The following post was originally posted at the blog “Dissident Voice” under the title, “My Visit to a Las Vegas Jail” by Brian Terrell. 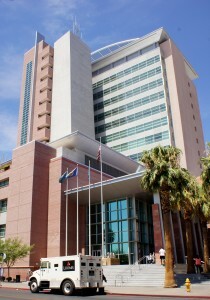 It describes the experience Terrell had dealing with the Las Vegas “justice” system after having been arrested during an anti-drone protest at Creech Air Force Base, which is located just north of Las Vegas and from where most of the drones murdering people in the Middle East are controlled remotely. Although it is rather long, it is well worth reading as it makes many important points about the nature of the court system and the way that the courts have essentially become a giant ATM machine for the government. Previously, I have written about these issues in relation to the Las Vegas courts. Those posts can be found here, here, and here. 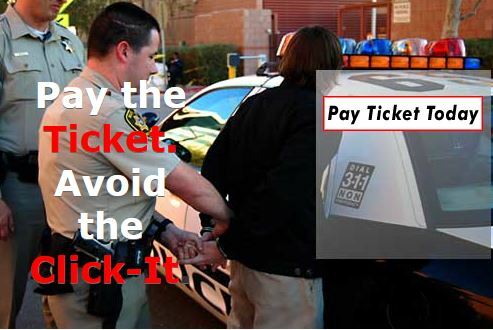 In due course I got a glossy postcard in the mail with a color photo of a perp getting handcuffed against a Metropolitan Police squad car, with the clever warning “Pay the Ticket, Avoid the Click-it.” This image, that can also be found on the court’s website, came with this threat: “The Las Vegas Township Justice Court will issue arrest warrants for all unpaid traffic tickets. 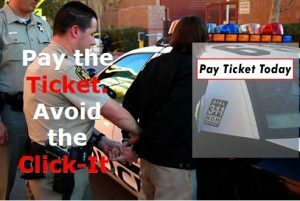 An additional warrant fee of $150 and a late fee of $100 will be added to all tickets that proceed into warrant status. In addition to warrant fees and penalties, all unpaid traffic tickets will be reported to national credit reporting agencies.” A search of my case on the court’s website showed that I had been charged to pay for my own warrant and another “compliance fee,” apparently to pay for my account getting referred to a collection agency, bringing my bill up to $348. Recent years have seen increased attention on the illegal enforcement of fines and fees in certain jurisdictions around the country—often with respect to individuals accused of misdemeanors, quasi-criminal ordinance violations, or civil infractions. Typically, courts do not sentence defendants to incarceration in these cases; monetary fines are the norm. Yet the harm caused by unlawful practices in these jurisdictions can be profound. Individuals may confront escalating debt; face repeated, unnecessary incarceration for nonpayment despite posing no danger to the community; lose their jobs; and become trapped in cycles of poverty that can be nearly impossible to escape. Furthermore, in addition to being unlawful, to the extent that these practices are geared not toward addressing public safety, but rather toward raising revenue, they can cast doubt on the impartiality of the tribunal and erode trust between local governments and their constituents. The use of arrest warrants as a means of debt collection, rather than in response to public safety needs, creates unnecessary risk that individuals’ constitutional rights will be violated. Warrants must not be issued for failure to pay without providing adequate notice to a defendant, a hearing where the defendant’s ability to pay is assessed, and other basic procedural protections. … When people are arrested and detained on these warrants, the result is an unconstitutional deprivation of liberty. The deplorable conditions and cruelties of this jail defy exaggeration and are as extravagant as the floor shows at the city’s casinos and hotels. It was more than eight hours after getting arrested that I was finally taken out of shackles. We were packed standing room only, more than forty people in a small cell those first hours in chains. This is a photo I took of the Brinks truck that they drive up to the front door of the Regional Injustice Center in Las Vegas every morning. If the machinations of the Las Vegas Justice Court are not about justice, neither are the drones controlled from Creech Air Force Base 40 miles away about defense. By remote control and often under the shadiest of orders by the CIA, military personnel at Creech are assassinating suspected enemies far from fields of battle, based on unproven allegations or on “patterns of behavior,” often incinerating their families or the strangers unfortunate enough to be close by. It should not be surprising that a government that executes suspects, sometimes even its own citizens, without trial in places far away will also imprison its poorest people at home without due process. It is unclear if what happened to me in Las Vegas Justice Court on April 4 was a conviction in the strictly legal sense, but what happened there has certainly deepened my conviction that the so-called war on terror is just one front of the vicious war on the poor and on people with black and brown skin here at home as well as abroad. This conviction will lead me back to Creech and other drone bases, to the places targeted by their Hellfire missiles when I can and, if need be, back to the Clark County Correctional Center. Brian Terrell lives in Iowa and is a Co-coordinator for Voices for Creative Nonviolence. In recent years he has visited Afghanistan three times and has spent more than six months in prison for protesting at drone bases. For more information email info@vcnv.org. Read other articles by Brian.